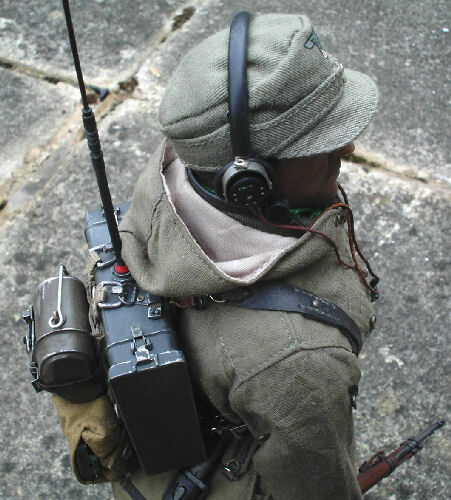 Welcome To My Gebirgsjager Radio Operator Page. 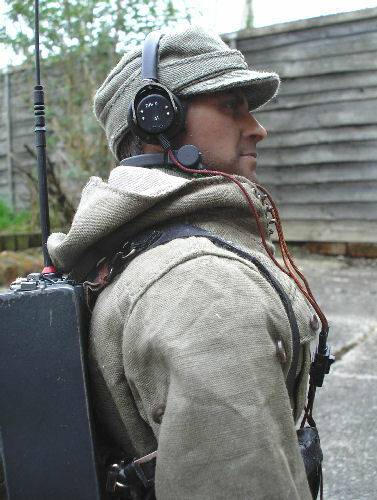 This model is based on my other figure that I made of a German radio operator, which unfortunately I do not have anymore. So as a replacement for it have built this one, one of the differences is that I am using the new DiD metal radio unit which came with the Wolfram figure. Overall I am impressed with the radio unit A as it is metal and I think die cast, which is a weight of 90 grams on it's own. 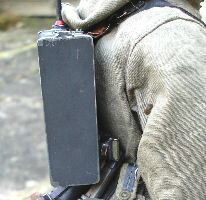 And in the picture I have used here, with the metal mess tin, gas mask, bayonet and water bottle B. In my opinion, I think that the boxed figure may have a problem standing up, as there is a lot of weight there to pull it backwards. Though I am willing to be corrected on this, by someone who has assembled the full figure. The dials do not move. The top clips that hold the side panels in place, are crisp in their detail, but they may have to be handled very carefully. The radio wiring as shown in C are very good pictures, of how far the pins for the wires can go into the radio. As I have not been able to get them into the holes any further than this, as they look like plastic and if you force them they may break. 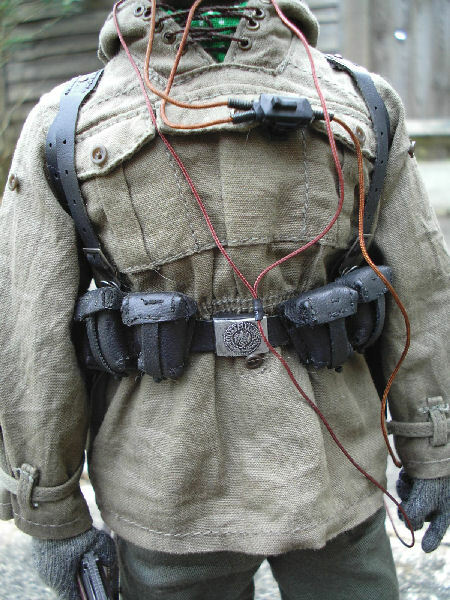 D are the headphones and they have to be very carefully turned to get them to fit on a figure's head, as the rivet holding them together is quite tight. The canvas strap E is well made and the clips to hold it in place are again nicely detailed in metal, although care has to be taken with the leather straps connected to it. As the belt has to be put through these loops. 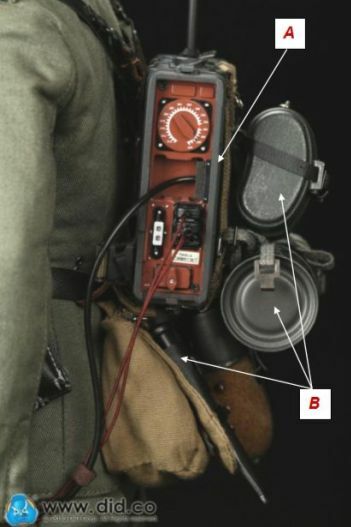 There is no carry handle on the top of the radio as shown in F, although the metal parts on the top do have a very small gap in them. So a thin piece of leather could be pushed through to replicate this. I got my radio model loose so the clips G were missing, which to me is no real worry as I can hopefully make these myself. 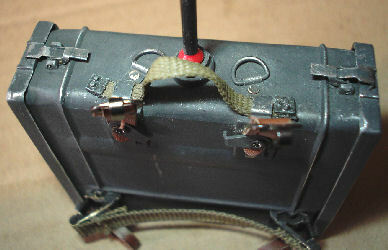 The leather strap at the back and bottom of the radio H, can be taken off the pip to hold the 'A' frame in place. But again this has to be done carefully as the rest of it looks like it is glued in place on the metal radio body. 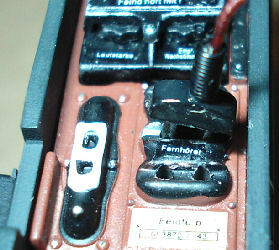 There are also two rings on the top of the radio to fix the 'A' frame to, as well as two angled metal clips on the base for the 'Y' strap connectors. I is what looks like a morse code handset again made from metal, which connects very loosely to the end of the thicker wire. The aerial is fixed into the top of the radio, with the actual aerial made from what looks like wire. It is easily bent, but putting it between two books should straighten it out. The rear main leather straps to fix the radio to the 'Y' strap are nicely made, but the wrong shape when compared to the real radio. 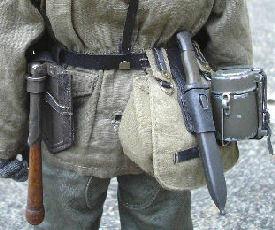 But then again these items could be difficult to mass produce in 1/6th scale, so I am not really fussed about them. 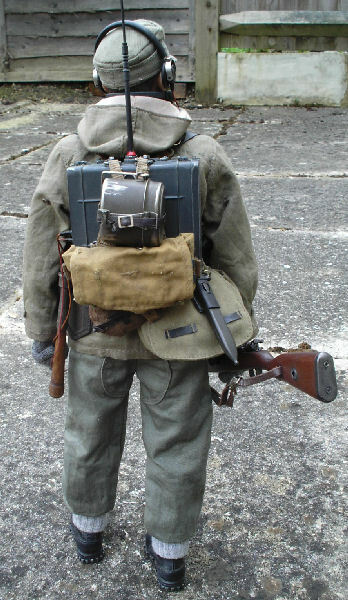 As I said before I am very impressed with the radio model, as it has a lot of very good detailing on it, and the decals are very well produced. The only real concerns I have are the weight of it, and that I may have to drill out or slightly enlarge the holes for the wiring pins. 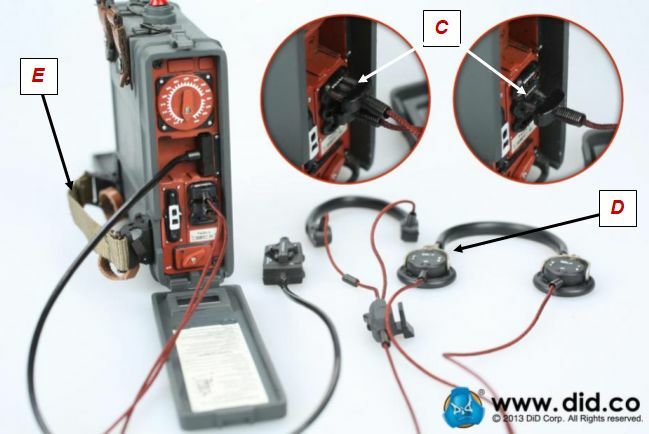 Note: Even though the radio is made from metal, I do recommend taking care when assembling it onto a figure as it is better to be safe than sorry. The headsculpt is again one that I got loose, but I cannot remember who made it. I have had to remove some of the inside of the neck post, so that I can get it to fit onto a Dragon Neo2 body. I have also given it the usual pastel wash treatment to add some darkness to the face, as well a drybrush afterwards of Flesh pastel chalk. Pictures 1. & 2. are of the head as I got it loose, with pictures 3. & 4. taken outside in daylight to see just how much the pastel chalks had changed the headsculpt. With the clothing for this figure I have been experimenting with the pastel washes on it, I have had some good results with camouflage material. So I got to wondering if I could get a different colour with a plain material, so I gave the new Toys City gebirgsjager anorak a wash with some Brown pastel chalks (not oil pastels). 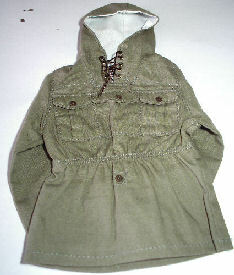 The same way that I did with my Heer smocks and the Heer winter suit. Picture 5. is the new anorak as I got it loose, before I have given it the Brown pastel chalk wash in Picture 6. to show the difference whilst it is still wet. 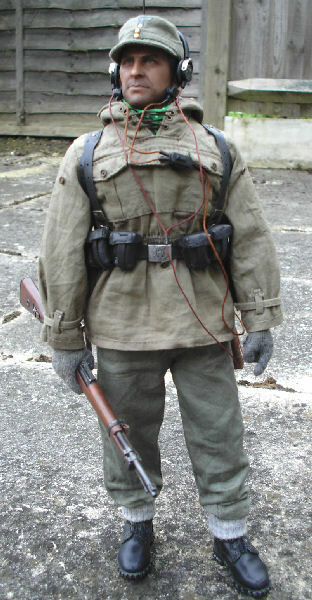 Picture 7. is the smock on the figure, after I have also given it a drybrush with some Light Sand weathering powder, the picture taken outside to show the slight colour change. 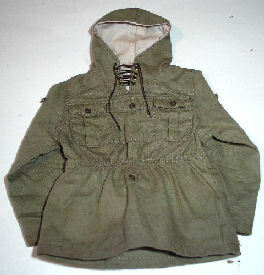 When I took Picture 7. outside in daylight, something struck me about the colour of the anorak, as it seemed to be too light in colour and I could not work this out. 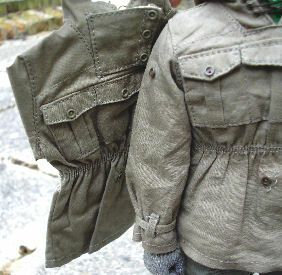 I have just realised by placing another new Toys City anorak, behind the one that I gave the pastel wash to, in the picture on the right. That somehow instead of going a darker shade as I was expecting, the washed anorak on the top has gone to a lighter shade, when compared to the new anorak behind it. I do have a slight Brown tint in places from the colour of the pastel chalk, but somehow in the process of applying the pastel chalks. And then using a tissue to mop up the excess water, plus scrunching the anorak up in my hand, and then laying it flat on my radiator to dry. The original Green colour has changed to the lighter green colour as shown on the right. Which has confused me slightly, because I got a totally different result in Pictures 12. & 14. on my Pastels page, when I did exactly the same to the Dragon smock and winter suit. 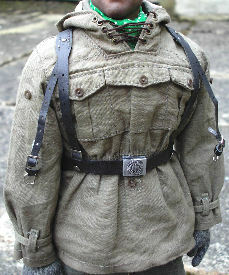 The other clothing that I have used with this figure, are a pair of DiD Hanke trousers (again pastel washed lightly), a Dragon tunic, DiD boots that have been repainted with Black paint. A Dragon M43 cap and a pair of Twisting Toyz socks over the boots. Picture 8. is of the belt equipment that I have repainted with Black acrylic paint, so that I have a flat uniform colour with them, plus I have also lost any glossy effect they had. Pictures 9. & 10. are the items on the belt after I have given each of them a drybrush of some Light Sand weathering powders. 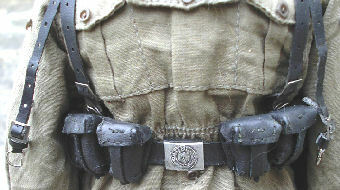 The buckle on the Toys City belt, has been given a wash of black paint which was then wiped off to keep the colour inside the detail. Pictures 11. & 12. are of the DiD boots that I am using with this figure, they were originally Black but glossy. So I have repainted them with some Black acrylic paint to get a flat finish to them. Plus I have weathered them with the damaged toe cap. Once dry I then gave them a drybrush of some Light Sand weathering powders, and as shown it helps to bring out the details of the boots. 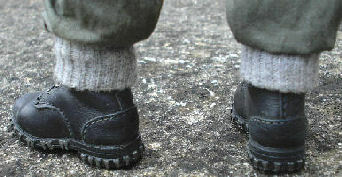 Also shown are the socks I used with this figure, which came from the Twisting Toys Marco figure. 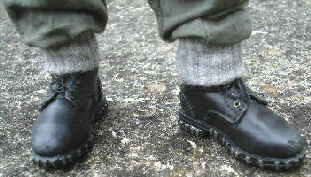 Which have been put over the bottom of the trouser legs and then folded over the boot tops. With my other radio figure I made, I had to make a lot of changes to the plastic radio unit. But this DiD unit is made from metal, which I have found is a lot stronger. 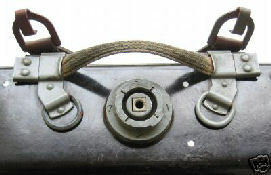 But there are pieces to be careful with, such as the clips on the top which hold the side panels in place. 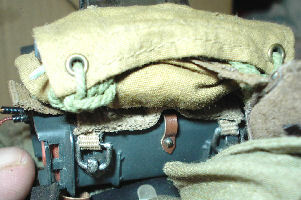 As well as the clips to hold the auxiliary 'Y' straps in place, as I found on my radio the mountings for the waist strap were a little loose. Note: I have found as I mentioned it earlier in my review, that the metal unit on the back of the figure Along with the metal mess tin and water bottle, does make the figure have a tendency to fall over backwards. 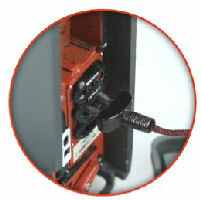 One item missing from this radio unit is the handle on the top as shown below. On this figure I have used a pair of DiD 'Y' straps, which I have also repainted with some Black acrylic paint, because to me they were too glossy plus they also have white threads. 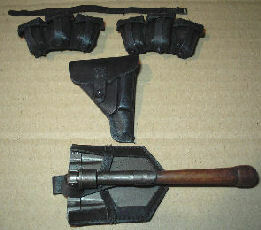 Picture 15. shows the 'Y' straps that I repainted and gave a drybrush of some Light Sand weathering powders, with the top hooks for the radio connected to them. 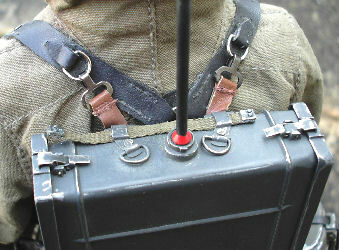 Picture 16. shows the side connector on the radio for the auxiliary straps on the 'Y' straps, with Picture 17. showing the loop from the strap connected. Also shown here is where I have scraped the edges with my model knife, to replicate the wear and scratches on the radio edges. Which has given a nice worn effect to the radio, and as the metal that the radio is made from is a Silver colour, I don't have to do a drybrush of Gunmetal or Silver to get a worn effect. 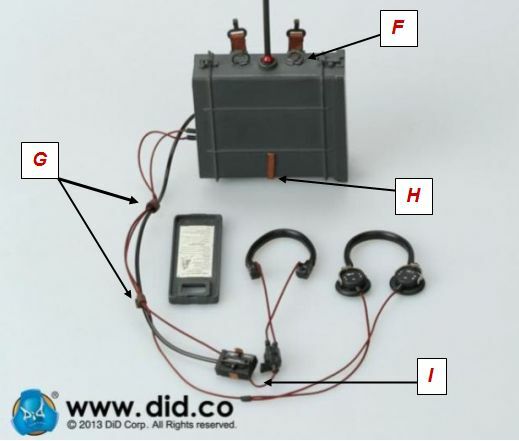 One of the problems that I found with the DiD radio unit, are the connectors for the headset and microphone. As shown in Pictures 18. 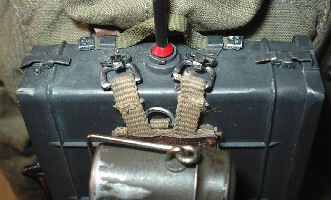 & 19. the connectors cannot be fitted fully into the radio unit. So to get over this I used my model drill with a fine drill bit, and I drilled out the holes so that the pins would fit into them. (Note: I first put the drill end into the holes and then started the drill, as this way I stay in the hole so that it does not slip and cause damage). So that as shown in Picture 20. after also carefully sanding the pins, I can get the connectors pushed in place. Like my other radio operator figure I have also put an 'A' frame onto the front of the radio, but because I got the radio unit loose I did not get the DiD frame. So I have had to use a Dragon 'A' frame instead that I had in my spares box. 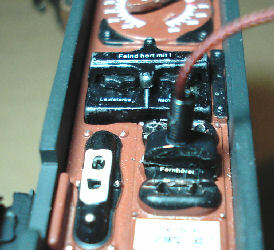 Picture 21. is of the top connectors that fit quite easily, but the Dragon 'A' frame connectors on the bottom as shown in Picture 22. are slightly too big to hook fully into the radio hooks. So I will have to sand the back of the connectors slightly, so that they clip in place. 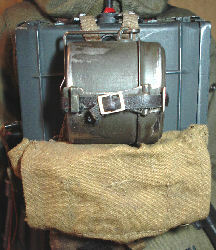 Picture 23. shows the 'A' frame in place, with a DiD metal mess tin with a Dragon bag, into which I have also put the side panel for the radio. 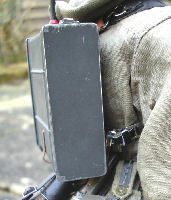 The pictures below show the finished figure, with a DiD rifle.